As a result of his injuries, Ali Wahdan is unable to find work as a mathematics teacher, and is confined to his wheelchair. The statistics that tally the dead in the most recent Gaza war are routinely disseminated in the media, and in factsheets about the conflict. It’s only when you see a shelled house, where destroyed rooms were once filled with people, and are now empty, that the human cost of the war sinks in. By SHAUN SWINGLER. Ali Wahdan was mourning his dead parents when the bomb fell on his house in Gaza. They had been killed just days before, in a blast that claimed the lives of another six of his family members. Ali didn’t know then that the latest blast would obliterate nearly all that remained of his family, and maim his body. In his own way, he is an unwitting symbol of the human cost of the Gaza war. Both his legs have been amputated. He is defiant, however, in his hopefulness. He greets me and my fixer with a warm smile, as he invites us into his rented house in Beit Hanoun, in northern Gaza. 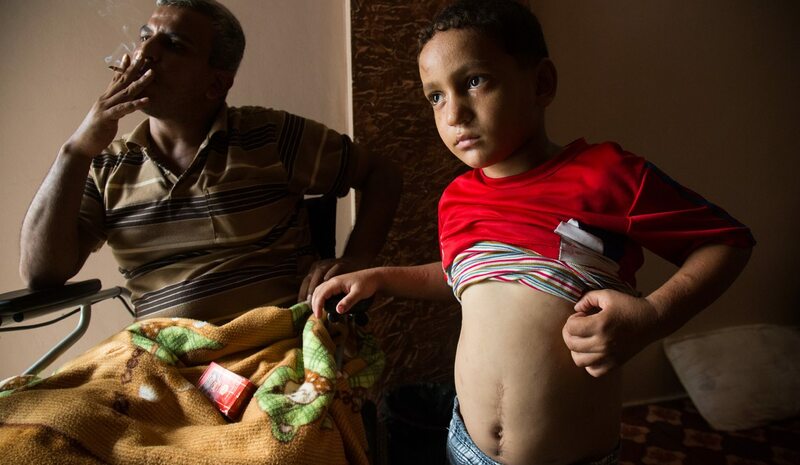 Beit Hanoun was one of the hardest hit areas of Gaza during last year’s 50-day conflict. The 36-year-old offers us Turkish coffee, and lights a cigarette. His sons Mosaab and Omar flank him as he talks to us, occasionally finding something more interesting to do in another room. Ali stays in the house with his surviving sons, just a block away from the blast that took his wife, brother, and two of his children from him. The bomb destroyed his right leg, and maimed his left, which was later amputated. After two months in hospital, drifting in and out of consciousness, Ali was finally able to speak to his son Mosaab on the phone. Understandably fearful that the weight of the loss would destroy his already fragile health, medical staff and family kept the truth from him. Ali sits off to the side of the living room in his motorised wheelchair while he retells his story, occasionally taking a long drag from his cigarette. As a result of his injuries, Ali is unable to find work as a mathematics teacher, and is confined to his wheelchair. The statistics that tally the dead in the most recent Gaza war are routinely disseminated in the media, and in factsheets about the conflict. It’s only when you see a shelled house, where destroyed rooms were once filled with people, and are now empty, that the human cost of the war sinks in. The 50-day war led to the death of 2,200 Palestinians, most of whom were civilians, and 550 of whom were children. Eighty-five Israelis lost their lives, 6 of them were civilians. Of the 3,436 Palestinian children who were injured, 10% suffered permanent disability, according to a report published by Save the Children. One Israeli child was killed, and 270 were injured. Twelve of those Palestinian casualties were Ali’s family members. According to the UN, nearly 100,000 homes were damaged or destroyed in Gaza as a result of the conflict. This destruction led to tens of thousands of displaced Palestinians in Gaza. Rebuilding efforts are underway, but they are moving slowly due to a lack of funds, and restricted access to building materials. Many Palestinians whose homes were bombed have been moved to temporary shelters while they wait for them to be rebuilt. Others are staying in the shells of their former homes while they rebuild the houses themselves. Some, like Ali, rent houses to live in. Additional reporting by Mohamed Zaharna.